Home › asking for and accepting forgiveness › Precious AND FREE! I’ve been in this library — I even took a photo myself — but it was predigital and lost to me. This photo gives me the feeling that the books are CHAINED like prisoners. 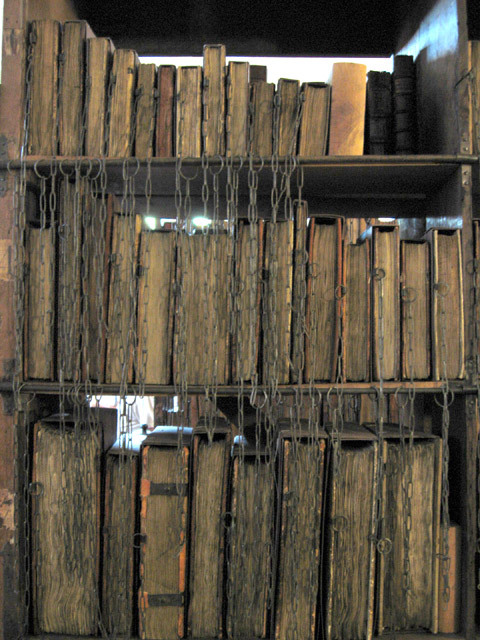 When I was there — it was clear that these books were so precious, so valued, that the were chained to the shelves to keep them safe. Two different ways of seeing the same reality. I suppose women kept in a harem could be looked from either point of view. Prisoners or Protected? We are all of us chained, God. Chained to our culture – family viewpoints, community viewpoints, country viewpoints and values. And since this has been the way it is from our birth — we don’t notice. It takes a trip abroad or having a friend with different viewpoints to let us see that we aren’t totally free from our upbringing. But seeing isn’t becoming unchained, is it. As I look at this photo — and imagine people in the place of the books — I am utterly convinced that YOU want us FREE! No one values us more than YOU DO. WE ARE PRECIOUS TO YOU! PRECIOUS AND FREE. Gosh, if only we had as much compassion for ourselves as You have for us! You don’t want us to suffer from guilt — YOU LONG TO FORGIVE US! We just have to ask You — and humbly accept. You LONG to give us LIFE and LIFE ABUNDANT. Help us, here, God. Please Help US ALL!!! !